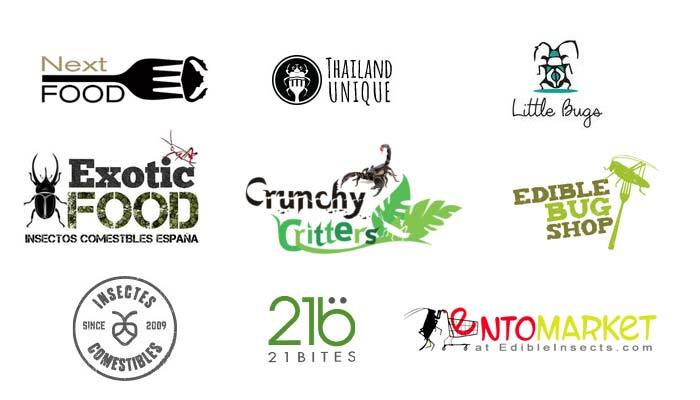 The Eating insects startups: Here is the list of Entopreneurs around the world! - Bug Burger - äta insekter! 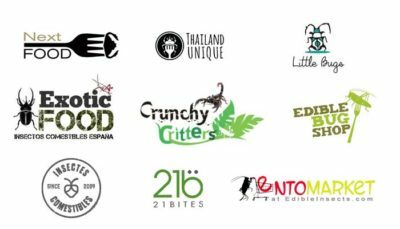 This list was originally created on the 23rd of October 2015 to honor the first edition of the World Edible Insect Day. It is a list of entopreneurs around the world. With entopreneurs I mean companies, organisations and individuals who either are working on an edible-insect product, are planning to deliver one or are just advocating the benefits of eating insects. It also includes insect farming and other related businesses. In early 2019 I decided to change this categorization as many producers where working in different fields. Instead it uses broader categories and have been organized in way where you can see which countries different companies are based. The list is not complete and will never be complete. Keeping up with the development of this business is almost impossible. Please let me know if you find something that is missing or wrong! Please post comments if you would like to add a company to the list. 252 companies/brands on the list! Please contact Bugburger if that is not the case. 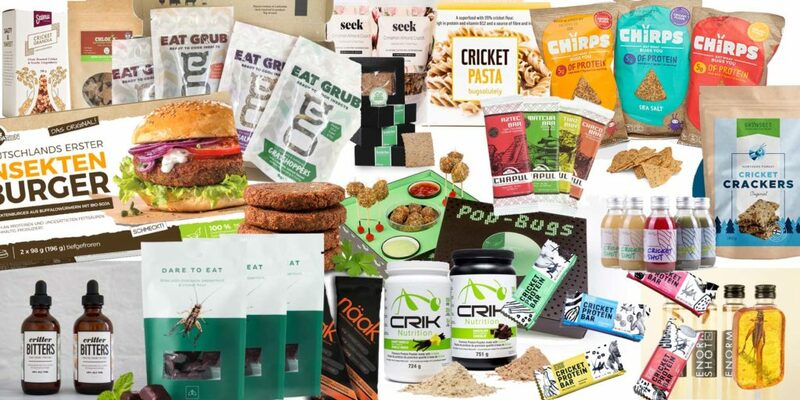 Here is the list of companies selling edible insect products under its own brands. Protein bars, insect powder, snacks, crispbread pasta, and more unique products like insect infused beer, bitters, smoothies and burgers. Australian company selling cricket powder (with different flavours) and soon also bars. Cricket bar, powder and roasted crickets. 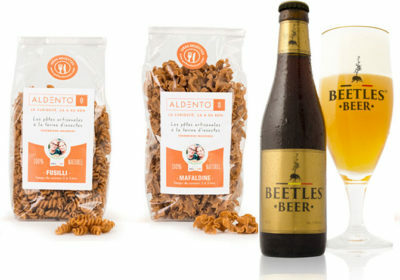 From Belgium insect pasta (Goffard sisters) and Beetles beer (Beesect). With the Aldento insect powder pasta. Powder, tapenade (! 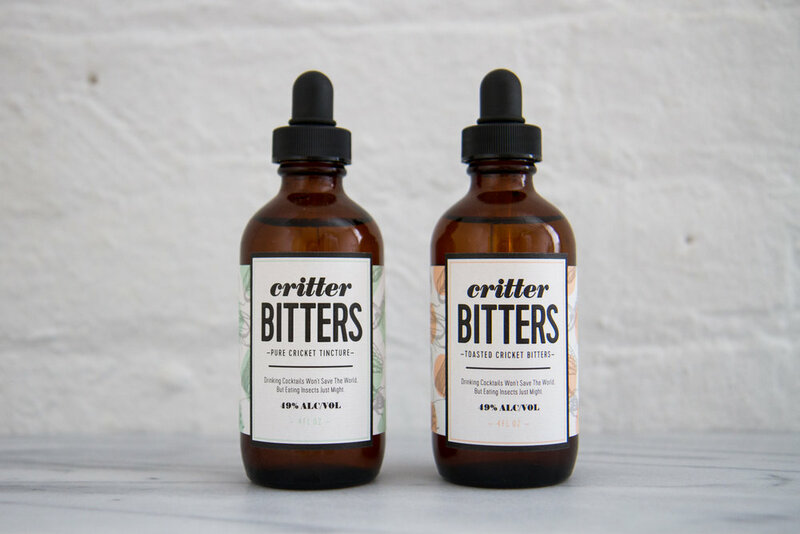 ), crickers and dried crickets. Makes food like ravioli and croquettes with mealworms as one of the main ingredients. 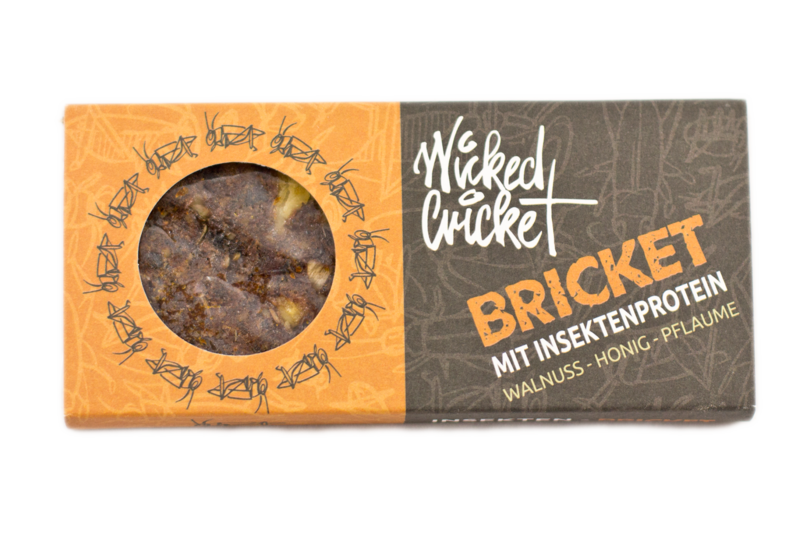 Extracts the protein from crickets and makes their own cricket-tofu: C-FU. C-FU Food has its own brand One Hop Kitchen (onehopkitchen.com) selling a bolognese with crickets. A wide range of energy cricket bars. Premium Canadian cricket farm growing crickets and also selling flavoured dry-roasted crickets and protein powder. Making the Bella pupa silkworm snack. Started January 2018. Will produce Burger, Protein Bar, Cricket Flour for Agriculture and Pet Food. Danish company making insect bars with lesser mealworm (and other snacks). Started out with selling chocolate covered crickets and now sell smoothies and a meat substitute with soy meal and cricket powder. Northern forest cricket crackers from Finland. Finnish company producing protein bars that now have launched protein bars. Sell dried house crickets in three flavours: natural, chilli and honey plus garlic and herb flavoured rye crisp containig cricket flour. All the crickets used in their products are grown and processed in Tervo, Northern Savonia. Creators of Insecteo (www.insecteo.com) snacks and Kinjao (www.kinjao.com) pasta. One of the biggest resellers in Europe, with a whole range of different products. I have personally tried out the spiced snack insects and protein bars. Micros farm selling its own products. Have released their own bug burger! Three different flavors of cricket pasta. A bar from Bear Protein. Europes first protein powder with insects! Uses buffalo worms from Protifarm. Protein flour, dried crickets and proteinbars. Pasta, cookies and a protein shake. 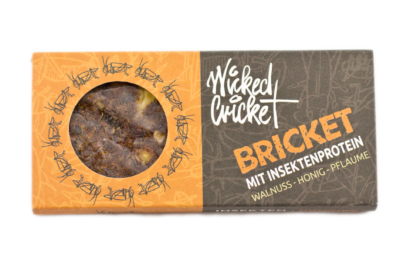 Wicked Crickets – bricket. A protein bar med with cricket powder. Developing an alternative to Palm oil: meal worm oil! Israeli company working with fruit fly larvae. The currently produce whole powder, reduced-fat powder, dry larva and larvae oil. Future food from Korean company Edible Inc.
Norwegian startup selling cricket powder under its own brand. Breeding and selling insects both whole and prepared. Working on commercializing edible insects in Peru. First prototype “the demolitor”, a power bar. The only company in South Africa and sells flavored Mopani Caterpillars or Mopani Worms as they are known there. Barbeque, chilli, chutney and the original salted flavour. Sells a cricket bar and crispbread. The first Swedish entopreneur breeding its own mealworms. Working on their own protein product based on mealworms. Farming insects and producing products like mealworm paté, crispbread and mealworm balls! Have launched their cricket pasta! 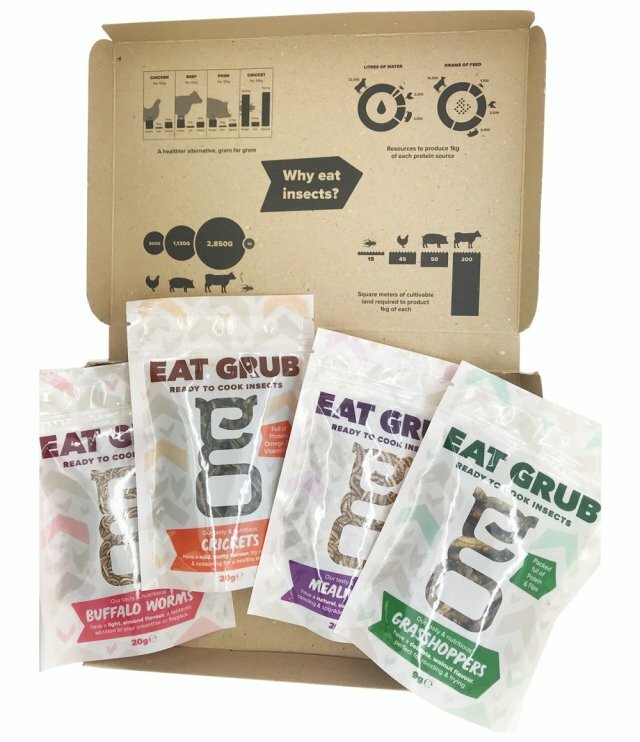 Except selling protein bars, snacks and cricket powder Eat Grub is selling freezedried insects , collecting recipes and advocating insect eating. UK farmed mealworms sold whole and as powder. Aspires brand for cricket products. The company behind the cricket powder Griopro (cricketpowder.com) The “original patented cricket powder”. Sells their own cricket flour mix (mixed up with coconut and cassava) and cricket snacks. Used to sell cookies. A brand from Harrison Food Group. One of the pioneers. There are lot of people out there that think Patrick Crowley really came up with a great way of serving crickets as food when he founded Chapul (Aztec for crickets). Chapul sells both cricket bars and insect powder. Used to be called Six foods. Produces Chirps crisps and protein powder. 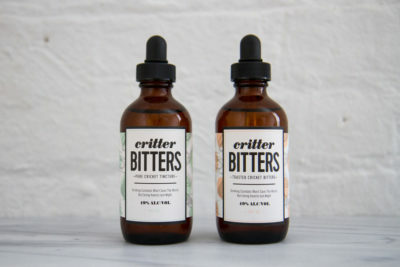 Cocktail bitters made out of crickets! A sustainable urban protein firm focusing on locally reared insects for food and feed. “The prehistoric snackeria”, originally started out selling mexican insect food, but now also selling its own products. Previously known as Next Millenium Farms. Has a lot of interesting products. Hotlix are the pioneers of “insects candy” and started their business in the 70:s. They sell the classic lollipops with a worm, dried grasshoppers etc. They have relied a lot on the scary/yuck factor of insects, and maybe they won’t do that well when insects become more mainstream. Bars, powders and cricket pasta. The products sold on Amazon. In the list below I include companies/chefs focused on insects. I’ve not included restaurants that have one or two dishes with bugs on the menu. If you know Swedish or do a google translate you can read Bugburgers article on gourmet restaurants like Noma in Denmark and D.O.M in Brazil. Bugburger has also have visited Archipelago in London, and Mexican restaurant Ty y Yo in Boston. A group that get together once a month to enjoy edible insects. The company’s primary objective is to create a sushi bar with just edible insects. If you need an entochef in Norway, call Chef Gouttebel! 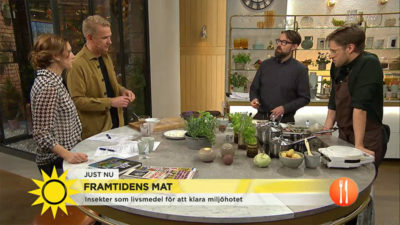 Ola and I on Swedish tv morning show . 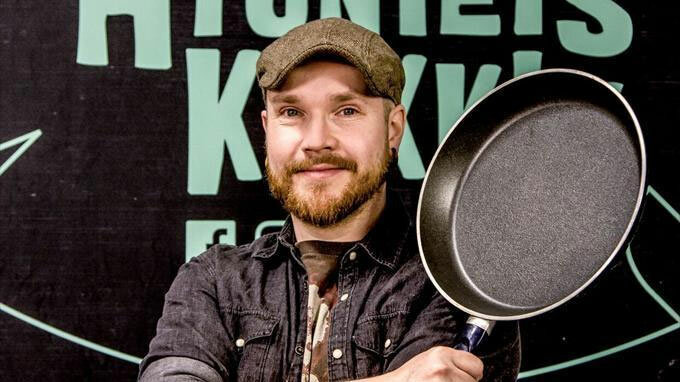 In Sweden Ola Albrektsson (who made the recipes for my book) is the go to guy if you want to know more on cooking with insects. The first dedicated insect restaurant in Britain. The guy behind the classic “The Eat-A-Bug Cookbook”. The restaurant at the Audubon Butterfly Garden and Insectarium. “The prehistoric snackeria”, serving mexican bug food. Aly Moore knows how to serve insects. Joseph Yoon started the Brooklyn Bugs festival and a career as entochef. Another important notice: Most of the companies above have their own shops selling directly to their customers. Below are companyies who sell a range of different insect products. Most of them sell worldwide, but it can of course be good to pick one near you to make it cheaper and a bit more sustainable. Webshop selling Finnish insect products and imported insects. The shop with the widest range of insects. Many of them also sold in shops in the US and Europe. A farm that sells their home grown insects. And they also sell them wholesale if you want to start a restaurant or consume a lot of insects. Selling food made of insects and other “future food”. Here is a list of companies who works primarily wholsesale selling insects to restaurants, shops etc. A company that sells a lot of exotic animals as food. Including a couple of species of insects that are sold frozen to shops. 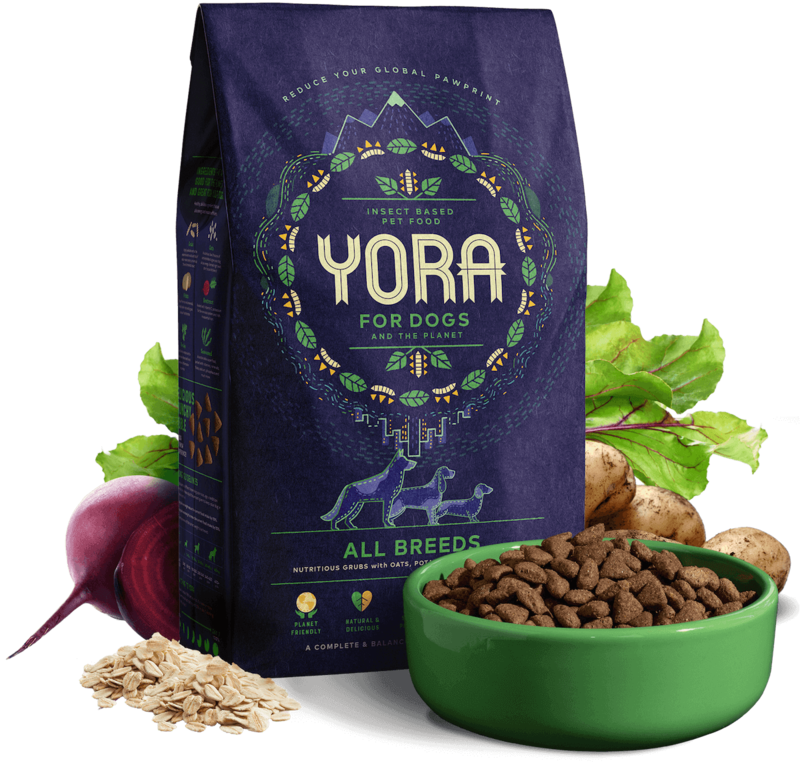 Yora dog food made with insects. Why not give your best friend an insect snack? 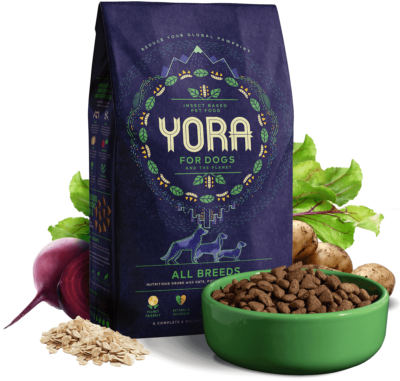 Dog food with a smaller pawprint! Several companies see the potential in feeding livestock, fish, pigs and poultry with insects instead of other protein sources. Not as energy efficient like eating the insects ourselves but more environmentally friendly then shipping soya beens all over the world and feeding fish with fish. Especially if you can feed insects with leftovers from for instance the food industry. Is a sustainable protein producer for animal feed by bio-converting organic waste using black soldier fly. Making products with Black Soldier Fly. Primarily for feed. Work since 2012 with the Black Soldier Fly, primarily for feed, petfood, and technical applications. Here a list of companies that are rearing insects for human consumption. Some really large, some small scale. Working on developing an automated cricket farm. EntoCube insect farm works well almost everywhere, but the original idea was to provide a solution for poor people in developing countries. Now they are more concentrated on providing solutions for cricket farmers in Finland. World’s first commercial grasshopper farm. Active from Israel and sells whole grasshoppers and grasshopper powder. Located in Guadalajara, Mexico, where Nutrinsectos raise food grade crickets, Mealworms and Superworms. Norweigan startup who is breeding mealworms with the plan of making petfood, plants nutrition and human nutrition. Urbanmat.no is a cricket farmer(field crickets) and mealworm farmer in Norway. We produce live food for pets, cricket powder, dried crickets, roasted crickets and cooked crickets. Founded by Canadian, Cricket Market is the first and only autorised Commercial Cricket Farm in Panama. Central and south America Largest cricket farm focused on organic and 100% tracability. Swedish/Thai company building a big modern insect farm in Thailand called Insect City. Automated BSF farm based in London. Farming crickets for food in the UK. Aspire has two parts: One part working on commercial cricket farming in the US. And one part in Ghana which is a commercial palm weevil farm and “a program which empowers peri-rural farmers to raise palm weevils locally”. Cricket farm selling insects (super worms, crickets and BSF larvae) as pet food. New Generation Nutrition is a frontrunner in developing insect-based solutions for feed and food, in both developed and developing country contexts. With over ten years of combined experience, NGN aims to provide sustainable insect applications that have economic, environmental and social value. 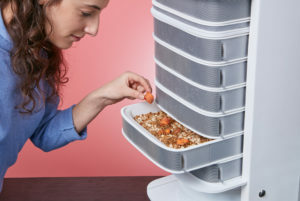 Mealworm farm but also the creator of the pupae sifting tray and pupae bridge. Check it out! An Insect Center focusing on Advice, Research & Production of both mealworms and Black Soldier Flies. They also teach others how to start farming. Helping you setting up your insect farm. It ‘a start up that has created a breeding technology for Acheta Domestica, dedicated to large retailers. To date, we breed and experiment with future products to put human consumption on the market. The people who search and contact us are interested in breeding and starting up a business using our technology. Tiny farms great open source project where insect farmers share their experiences and practices for insect farming. They have also set up an open source kit on GitHub. Katarine Ungers beautiful project Farm 432 has turned into a real product the Hive that you can buy now! The Cricket Man, Marc Sanchez, has helped setting upp micro farms and larger farms since 2007. Some companies main focus is to come up with solutions that can help poor people in poor countries breed insects and give them a cheap source of protein. Working on a breeding case that can be used by poor communities. MealFlour is a social enterprise founded in 2015 to promote better nutrition through sustainable farming of protein-rich mealworms. On their webpage you can find a list of all edible insects in the world! IPIFF is a non-profit organisation founded in 2013 which represents the interests of the breeders associated to this organisation. IPIFF gathers the main private players in the insect industry. Woven Network is set up to directly benefit, through a set of membership services, entrepreneurs and researchers working in the role of insects in the human food chain. Indirectly, through supporting its members, the company will also benefit the wider public across the Globe that need sustainable, alternative sources of protein. Unite all actors working in Belgium on the breeding and/or use for commercial purposes of insects and other arthropods. Exchange and spread the knowledge regarding of insects and other arthropods, more specifically about their breeding and different commercial applications, to the general public, public authorities, the academic world and at a corporate level. To promote Research & Development regarding the breeding and commercial use of insects and other arthropods, or parts/extracts thereof. Organisation for the dutch insect industry. 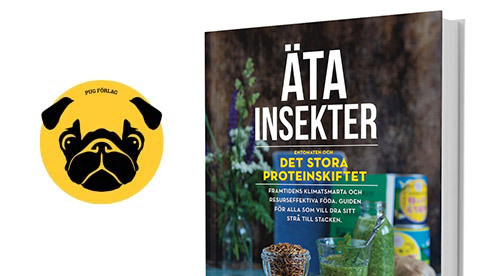 The Swedish insect food and feed business organisation. InsectCentre is a network organisation. Our goal is to connect all parties who have an interest in contributing to the introduction of insects as feed, food and pharma in order to speed up accomplishments which are greater than those a single participant could reach. A cocreation platform for companies up- and downstream to create new products and services around bioconversion with insects. Promoting positive, practical and industry relevant regulation and governance. Our purpose is to encourage and develop the Insect Protein industry to uphold the clean and green brand of Australian produce. We work to support Insect Farmers, Insect protein suppliers, and retailers. Ana Day is doing a great job on promoting edible insects. Check out 4ento! The classic source for entomophagy news. Florian Nock is an environmental engineer, certified nutritionist and a great advocate of eating insects. RNA, Robert Nathan Allen an co does a great job promoting edible insects in the United States. Patricia Stevens company Bugalicous could have been placed in several categories. She gives lectures, do catering, produces an insect bar (“the first Dutch insect-based bar ever”) and drives around her Insect van, “De Buggy”. A podcast, and bug news website, hosted by Marc “the Cricket Man” Sanchez. Danish Nina Askov, aka Buglady, is a blogger who combines the love of cooking with a big passion for insects as food. Just like Bugburger Lorenzo Pezzato have been promoting edible insects by journalism since 2014. But Lorenzo have been way more active then Bugburgers founder, and have really made a website packed with great journalism in three languages: Italian, English and Chinese! Don’t miss Daniel Ambühls fantastic Youtube channel with great interviews and videos from all around the world. He has also made a bee drone larvae cookbook! Now also in English. Michaela Dai Zovi has compiled a fantastic cook book packed with loads of insect dishes. She aslo updates her blog with news and recipes! Don’t miss Bugburgers Youtube channel… but honestly there are some even better channels out there. And podcasts! A great podcast hosted by Marc “the Cricket Man” Sanchez. Follow a great edible insect trip around the world! Chef PV:s insect cooking youtube channel. Check out Ross Ento podcast! Unfortunately not all make it. Here is a list of some of the startups that seems to have stopped existing. Most of the time the indication of this is that the webpage have been down for a while, sometimes its through info from the founders. Please contact Bugburger if the business is still operating! Cookies and seasoned dried insects. Swedish insect startup from 2015-2018. Didn’t make it. Unfortunately one of Swedens pioneer entopreneurs Hakuna mat didn’t make it. A polish start up that worked on cricket capsules. Bugburger likes the fact that Bens makes a hamburger “Great Burgondy”. They also sells an insect wok-dish. A unique drink from Nordic Food Lab! 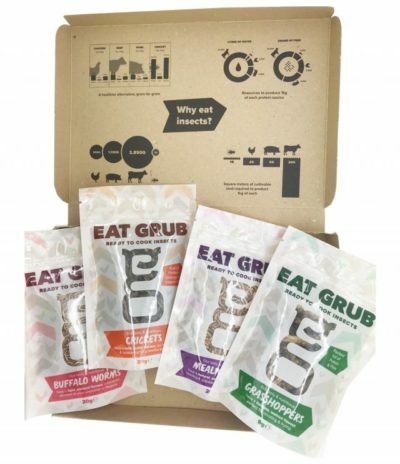 Established in 2012, offers edible insects (mealworms and crickets) of premium quality in Europe, fed with organic products only. One of the pioneers. The website is down, waiting for confirmation if they our out of business or not. Chris Derudder from Entomochef founded the World Edible Insect Day. Danish cricket farm in the Copenhagen area. Sell insects since 2002 in Germany. They also have their own cookbook, and hold cooking classes. ok. now on the list. What mail i can send pictures of our products? 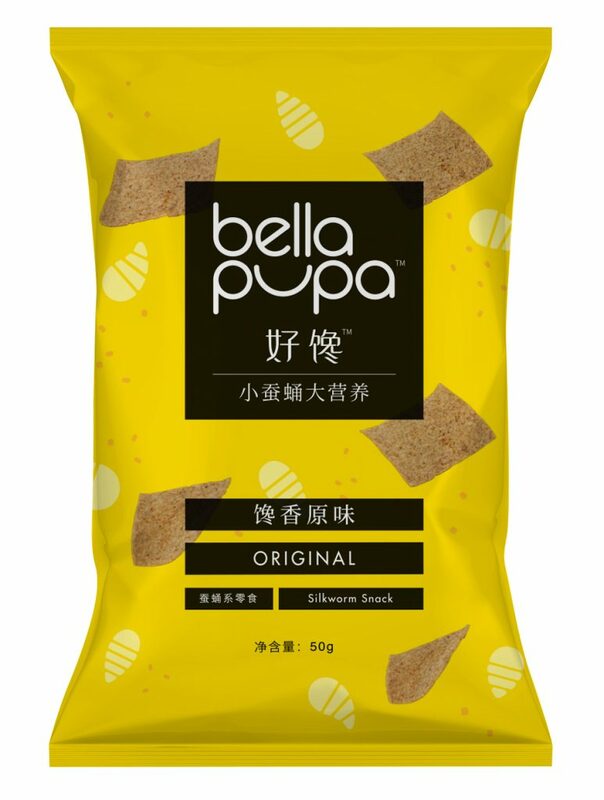 It’s Beau from Bugsolutely, we are a producer of cricket pasta (with probably the highest percentage of cricket ingredient in the market so far). It’s nice to read all the list of entoprenuers worldwide. We also do the same thing, listing the bug restaurant that makes up 100 places especially in the USA. We are still counting and updating more, too. However, is it bothering you or not if we would like to ask you to add us into the “cricket pasta” list? We are about to launch the product into Europe and USA markets as well. Feel free to check the 100 list of bug restaurant in our website’s blog post. Please add us to your list. We are an online retailer of edible insects and are developing a cricket flour based protein powder. 291 Film Company is producing a documentary titled Bugs on the Menu which advocates for the growth and acceptance of the entire Edible Insect industry and the companies and leaders that make it up. The answer to feeding the world’s expanding population may be smaller than you think. The feature documentary Bugs on the Menu travels to countries where the practice of entomophagy is common, and follows those people working to bring edible insects to Western cultures. Our Indiegogo campaign ends in 2 days! sorry for late reply. you are now on the list. Hope you get the funding for the film! Hur kan jag odla insekter på min skogsgård ? Kom ihåg att det än så länge inte är tillåtet att sälja insekter som människoföda. Men odla för eget bruk går bra. 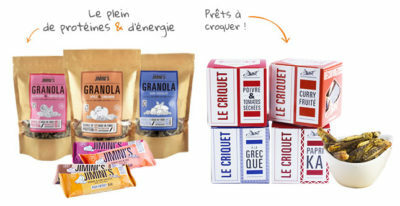 Hi, http://www.crickbars.com is another startup focusing on high protein products based on crickets/cricket flour. Our products will be available for sweden withing short! Please add us! Hittade din blogg och ser att du inte har med oss på listan, vi har sålt insekter i Sverige i 15 årstid, även levererat till Nobels fredscenter i Oslo och till invigningen av forskningsanläggningen i Uppsala. Vid flertalet tillfällen funnits med i TV4 och SVT. Gillar din blogg och hoppas kunna komma ikontakt för att kolla om vi kan bidra i arbetet mot Livsmedelsvekets slappa hantering av detta. Could you please include the Flying SpArk in your list? Flying SpArk is an Israeli startup company in the alternative protein space. 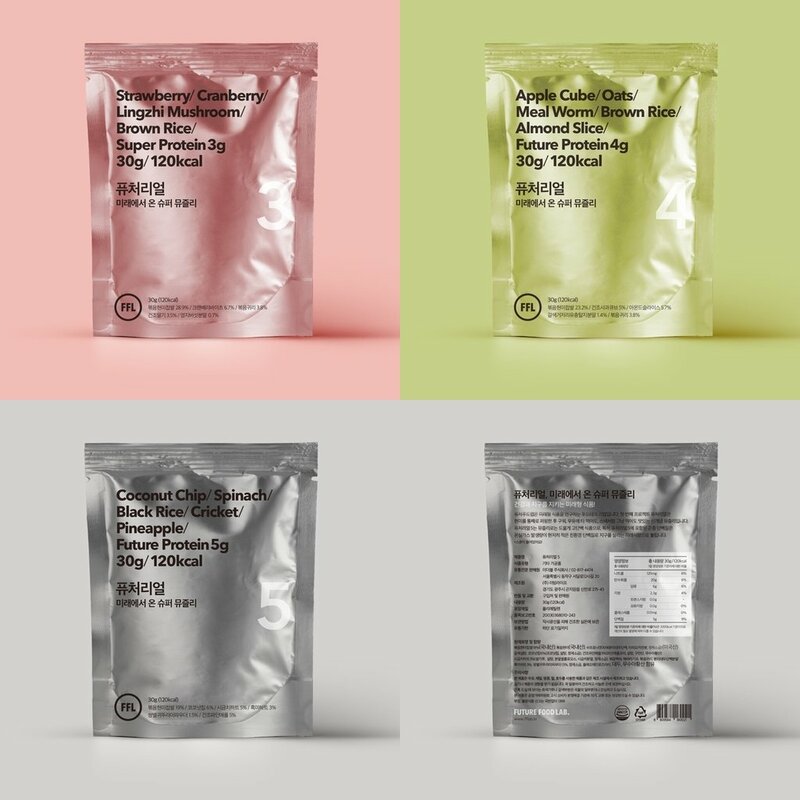 In line with our motto to “fill 9 billion bowls by 2040,” we are producing a high quality protein powders from the Med fruit fly larvae for human consumption as a healthier and sustainable alternative for animal protein. We currently have whole powder, reduced-fat powder, dry larva, and larvae oil. I have now included you on the list! insect cuisine in japan is not a company. It is a group where people get together once a month to enjoy eblible insects. However there are few food companies in Japan that use bees and locust as a part of japanese traditional food. Thanks for the info! There are not just companies on the list. I’ll move them to the advocate section! It would be great to have more info on Japanese companies selling insects as food. Do you have links to them? Here are some companies selling/making insect as food here in Japan. Please note that most of those companies are small and support only in Japanese. I am trying to promote them to abroad, so will contact you with more names shortly. Meanwhile, they are some popular companies. Hi! We have a family farm in Montana called Cowboy Cricket Farms. We raise crickets, do research, and sell 3 cricket products: Chocolate Chirp Cookie, Cricket powder, and Cricket flour. You are now listed as “Professional insect farm”. Why are they crossed out https://www.thailandunique.com/ ? Hi! I use a plugin that checks if links have stopped working. The times the plugin doesn’t get a respons from the website the link is crossed. Unfortunately this sometimes also happens to sites with a temporary failure. Hello! Please add me to your list! Thank you so much for that very complete list that will for sure be very helpful to start my business. Maybe would it be interesting to write a section about future entrepreneurs in this industry ? It could help them to find other people sharing the same interest but not daring to start their start up. In that case you can write me in. I am Baptiste Segers, 24, freshly graduated from a Bachelor dual degree in international Business. I have been dreaming for 3 years now to start my own company in the edible insect industry, either in the USA, or Canada. If you want to contact me for any reason, just use my linked in ( https://www.linkedin.com/in/baptiste-segers-78bbsegers/ ) or my e-mail : segers.baptiste@outlook.com. I wish I could see a lot of new entrepreneurs very soon ! Oj, jag hade visst missat att lägga upp GlobalBugs. Hello, i’m MasterBug and I create videos Recipes with insects in Italy. You are now on the list MasterBug! Hi! I think you forgot Microvita from Italy. Hi! Thanks for mentioning nextProtein! Would be very appreciated if you could write it like this “nextProtein” rather than the way it is! Great list! Also, just noticed we are in the FOOD section, but we actually are actors in the animal FEED sector! Thanks for having created and maintained this fantastic resource! We’re based in Montreal, Québec, Canada. Our Website and FB are currently only in the French language, but we’ll soon have English as well. Have you see Crickster? The danish company that believe everyone deserves to have the tools to live a happy and healty life. One of the things they are doing is providing products with insects. Have a great and lovely day. Hi you are already on the list! If you want to be in a different category, please tell me! Aspire might have been conceived at the beginning as food for the poor (in order to get the huge amount of money they got) but in reality what the look for is business. And I think it is OK to look for business, but to clearly state it. It is hypocritical to pretend doing charity but in reality looking for profit! Hi! I realized I haven’t updated Aspires listing for a while. Now the info is updated. Hey I am mentioning your site in my bachelor thesis, for that i need the name of the Author! Coudl you include Millibeter, founded in Belgium in 2012, in the list? We work with the Black Soldier Fly, primarily for feed, petfood, and technical applications. We have founded the Kempen Insect Cluster in 2017, a cocreation platform for companies up- and downstream to create new products and services around bioconversion with insects. Selling human food products, including producing our own and importing cricket powder. Ok! I’ll put you in the general food section! The Ento Podcast was missing from the list. I have now included a podcast section. Will there be any more episodes coming? We produce live food for pets, cricket powder, dryed crickets, roasted crickets and cooked crickets. You are now on the list in the category professional insect farmers. We are one of the first online stores in Spain to sell insects products for human consuption. My start-up farms domestic crickets for human consumption on a commercial scale. We process crickets into powder and whole roasted form. We are based in Malaysia and we supply to manufacturers worldwide. Email me for wholesale prices. You are soon on the list! The first entry from Panama! I’m planning to start a meal- and superworm breeding company for human and animal consumption in northern Finland. Would like to know if there would be companies interested in Sweden buying live, frozen and dried worms? Contacts by email if interested! Du tittade i fel kategori. Urban mat finns i kategorin Professional Insect Farmers. Men det kanske är fel kategori. Ja det er tiktig det. Men vi lager også mat og dyrefor. Kansje vi burde vært i flere kategorier. Vi heter Urbanmat i ett ord. Nu är ni med i båda kategorier. I am Arunee from Magalarva, an insect protein producer (using Black Soldier Fly larvae) for animal feed based in Indonesia. Would be awesome if you could include us on the list! You are now included on the list!